The thought of exercising while pregnant can bring up a host of questions. Can I keep doing what I was doing before? Should I avoid lifting? What are my limits? Pregnancy is complicated! Your body is shifting and changing in drastic ways — it’s no wonder you feel out of your element. But here’s the thing: exercising while pregnant is not only safe, it’s a wonderful way to help yourself (and baby!) feel healthier and happier during your nine months of pregnancy and beyond. Unless you have been specifically instructed to avoid exercise by your doctor, go for it! Wondering where to start? 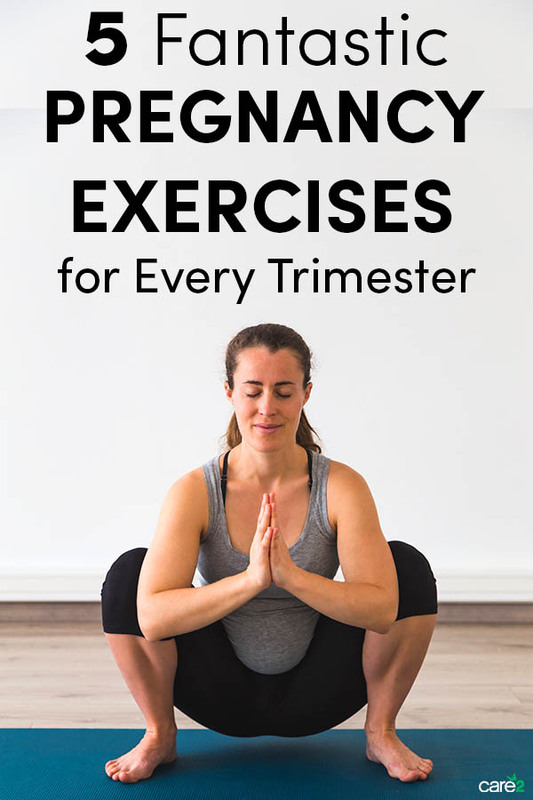 These exercises are guaranteed to be safe during every trimester of pregnancy (just use your best judgement and listen to your body). Bonus: all you need is yourself! No fancy equipment required. Particularly beneficial for mamas looking forward to a natural birth, the plié squat helps strengthen the quadriceps, hamstring and hip muscles, as well as improve balance. Additionally, the open position of the hips will help open up your pelvis and tone your pelvic floor, preparing you for labor. How to perform this exercise: Standing in a stable, wide-legged position with your hips and knees turned out, squat until your knees align over your toes. Pause and return to standing. If pregnancy is leaving you sluggish, you’ll definitely want to integrate this exercise into your routine. As your belly grows, you are likely to experience tightness in your core and side body. Extended side angle can help release this! How to perform this exercise: From Warrior II position, place your front forearm on your right thigh, then extend your left arm up and over. Deepen only as you feel comfortable and avoid over-stretching. Baby growing fast? Your lower back is probably taking quite the hit these days. To release tension at your neck and back, consider cat cow pose or one of these other ten exercises for neck pain. This is a great one to do before bed or first thing in the morning. How to perform this exercise: Come to all fours with your hands and arms aligned directly beneath your shoulders and your knees directly beneath your hips. As you breathe in, arch your back toward the floor and look up toward the ceiling. As you breathe out, reverse this motion, pulling chin to chest and arching your spine to the ceiling. You might feel like all your body strain is centered around your hips and core, but your upper body needs some love too! To activate the muscles in your arms and shoulders, try the lateral raise. It’s a simple movement, but feels great after a long day. How to perform this exercise: Simply raise your arms to shoulder level, then back down again. While one rep without weights won’t feel like much, multiples of these will start to burn (in a good way!). Perform as many as you feel comfortable, shaking it out in between sets. Step up circuits can help you keep your cardio up without needing to go for a run (thank goodness, right?). These routines work a number of key muscle groups (core, quads, glutes, etc.) and are also easily customizable, so you can design something that fits your skill level. How to perform this exercise: Select a stable stool or bench (approximately 18″ off the ground) and place it in an area that is clear of any other furniture or uneven surfaces. Begin with basic step ups, activating your muscles to maintain balance. If you’d like to progress, try one of these stair variations. Why not say Pregnant Women? I'd recommend yoga for pregnancy, found it very useful for proper relaxation among other things.